The Crystal Palace was a cast iron and glass building, originally erected in Hyde Park, London, to house the Great Exhibition of 1851. After the exhibition was over, the Crystal Palace was moved to its new home in Sydenham Hill, South East London. It burned down in 1936 when my mother was 14. She and her family, who lived in Sydenham, watched the flames and the glow in the sky from their home. One of her sisters ventured onto the site when the fires were out and picked up a piece of glass. We think it was part of one of the arches inside the building, as it still retains a beautifully smooth, curved edge. When you hold it to the light it sparkles and you can see rainbows inside it. 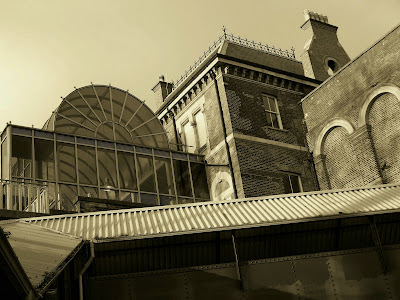 The photo is of Crystal Palace station. The design of the new ticket hall reflects part of the design of the old Crystal Palace. what a shame that this magnificant building went up in flames! it would have been fab. to have seen it, wouldn't it? I just finished a novel that mentioned the Crystal palace!